Safety is the primary driver of the increased implementation of winch-assist logging systems, and the main reason the technology will be part of the steep slope landscape going forward. Jobs like manual falling and choker setting in steep conditions are two big reasons logging is one of the most dangerous professions in the U.S., and doing more cutting from the safety of a cab and choker setting in cleaner conditions are a definite step in the right direction. Indeed, manual cutters are likely to see the biggest impact initially, but the spread of winch-assist steep slope systems has the potential to truly alter the nature of traditional cable logging in the Pacific Northwest. I’ve had cable loggers tell me time and again the biggest obstacle to expanding is putting together a new yarding crew. Meanwhile, blending winch-assist systems into the yarding process has potential to alleviate the labor crunch through grapple yarding or tethered skidding, for example, processes that are made more efficient and productive working with timber that’s been pre-bunched and rowed by a tethered felling machine. Reports and research show each tethered felling system can take the place of five to six timber fallers, and yarding bunched piles increases production by 15%-20%. Some of the production numbers can be eye-popping, with one supplier reporting on a demo where a tethered six-wheel grapple skidder was bringing almost half a truckload of stems to the landing per turn—every 10 minutes or so—and totally burying a processor and loader in logs. While cable loggers in the region are experienced with yarder skylines and guylines and related rigging and handling, winch-assist is a completely different application. For starters, the cable itself operates in tougher conditions, close to the ground and coming in frequent contact with dirt, limbs and debris. This means constant monitoring of cable integrity and reinspecting connections with every move. Planning and layout while working in tandem with manual cutting crews is also a new consideration. 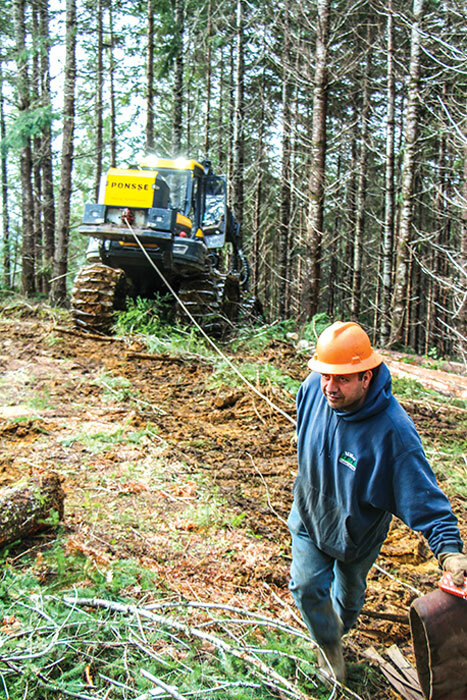 Smart loggers do these kinds of things every day, and suppliers have stepped up to the plate with improved carrier features, winch controls, and safety features, but it’s still all new for the most part, and everyone’s still learning what works best for them. One of the more ominous comments I heard while talking to some of the safety officials who’ve been observing and monitoring winch-assist systems is that “the environmental side of regulation hasn’t been vocal yet” and it’s unknown if there are any issues that will crop up on that front. Related to that are soil conditions and compaction. Research has shown that soil conditions are a better indicator of winch-assist system performance than severity of slope: good soil conditions make steeper slopes easier to work than more level slopes with poor soil conditions. Deep duff and excessively rocky conditions also impair performance. A major study at Oregon State University is looking at all aspects of steep slope logging, and soil compaction is one area that’s getting a close-up. While officials say early soil impact results are generally positive, researchers are also looking for ways to identify when and where soil conditions are not conducive for optimal winch-assist system performance. There’s a fine line between encouraging innovation on the one hand, but placing so many conditions on new systems that their development is stifled on the other. “We prefer guidance, not legal documents,” says Bruce Skurdahl, partner in Summit Attachments & Machinery and a member of the Oregon safety committee monitoring winch-assist implementation in the state. “If you’re too restrictive people won’t adopt it, but all we’re looking for is a clear path to follow—no one wants an accident,” he says. Indeed, results from widespread use in New Zealand and early returns in North America show the systems are truly safer for personnel working on steep slopes—and the production- and efficiency-boosting aspects are a bonus. But primarily, it’s those improved safety numbers that will make winch-assist steep slope systems more common in the future.